Take your kids on a spring adventure! "March 21, the first day of spring! Wonderful things this day will bring. 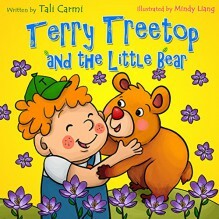 "In this book, Terry Treetop is about to play with a little bear that came into his back yard, when the bear's mother calls him back to the woods. But something went wrong and the little bear was in danger.Will Terry be able to save the little bear?Will they play together after all?This beginner reader’s eBook, the 5th in the Terry Treetop best sellers series, will teach your child about the signs of spring, and bears that leave their den in this season.Your kids will enjoy full-color illustrations of Terry and the bear cub. This book is written especially for you and your kids aged 2- 8, with simple text and 17 colorful illustrations.The story is suitable as a read aloud book for preschoolers or a self-read book for beginner readers.Scroll up and grab a copy today.